D-Day was the common term for the Allied invasion of northern France on June 6th, 1944. Nazi Germany had occupied France for four long years. In the early morning hours American, British, and Canadian soldiers began landing on a 75-kilometre stretch of beach in the French region of Normandy. Allied troops took heavy casualties but succeeded in the face of strong German defences. Their sacrifices achieved a crucial milestone on the path to Nazi Germany’s defeat. The term “D-Day” is a generic term for the launch date of any military operation. There were many D-Days during the course of the Second World War, but the importance of the Normandy landings has made this name stick to this particular operation. “H-Hour” was also a placeholder for the launch time. To keep track of the passage of time, you will often see the notation “D-Day +1” or “D+1.” This means one day after D-Day, or June 7th. Similarly, “H-Hour +1” or “H+1” refers to one hour after the time of the landing. Where did the Canadians land? Canadian soldiers were in the vanguard of the assault. Just after midnight on the 6th 543 men of the 1st Canadian Parachute Battalion descended by parachute to secure the seaborne landings’ eastern flank. Hours later Canadian assault troops stormed ashore on Juno Beach, a seven-kilometre stretch of sand featuring coastal villages fortified into German strongholds. Juno Beach was just one of five beaches the Allies landed on that day. The Canadians were flanked by British beaches “Gold” and “Sword” to the west and east, while the Americans landed beyond Gold Beach at “Omaha” and “Utah.” In total, some 156,000 Allied soldiers landed on D-Day. A total of 21,000 men landed on Juno on 6 June; 14,000 of them were Canadian, 7,000 were British. Download our Canada on D-Day Infographic. What defences did the Canadians face? Juno Beach was well fortified. Mines, barbed wire, and obstacles to Allied tanks and landing craft littered the sands. German machine guns, mortars, and artillery, often positioned in concrete bunkers, overlooked the likely Allied landing areas. Strongpoints in the German-held towns of Courseulles-sur-Mer, Bernières-sur-Mer, and Saint-Aubin-sur-Mer dominated the beaches. Courseulles was the most heavily defended area attacked by British and Canadian forces on D-Day. The strongpoints at Courseulles and nearby Graye-sur-Mer contained a dozen concrete machine gun posts covering a total of six artillery pieces overlooking the beach. Today, the Juno Beach Centre stands on the same ground as some of these positions. Where were the Canadians from? The Canadian soldiers who landed on D-Day came from across the country. The 3rd Canadian Infantry Division made the seaborne assault supported by the 2nd Canadian Armoured Brigade. At Courseulles, the Western Canadian battalions of the 7th Canadian Infantry Brigade made the assault. The tanks of the 1st Hussars from London, Ontario supported the Royal Winnipeg Rifles, the Regina Rifle Regiment, and the Canadian Scottish Regiment from Victoria, British Columbia. The Queen’s Own Rifles of Canada from Toronto assaulted Bernières while the North Shore (New Brunswick) Regiment landed nearby to attack Saint-Aubin. Tanks from the Fort Garry Horse, raised in the Winnipeg area, supported both attacks. Le Régiment de la Chaudière, from the Québec City area, was the 8th Canadian Infantry Brigade’s reserve and came ashore behind the Queen’s Own. The Highland regiments of the 9th Brigade were in reserve and landed at Bernières later on the 6th. They included the North Nova Scotia Highlanders, the Highland Light Infantry of Canada (Waterloo County, Ontario), and the Stormont, Dundas and Glengarry Highlanders from southeastern Ontario. The Sherbrooke Fusiliers Regiment from Québec formed the armoured reserve. Newfoundland was not yet a part of Canada in 1944. Nevertheless, plenty of Newfoundlanders joined the Canadian military. Others joined the armed forces in Newfoundland and served in Normandy with the 59th (Newfoundland) Heavy Regiment, Royal Artillery or at sea with the Royal Navy. Your Canadian city, town, village, or county was probably represented on D-Day, even if just by a handful of servicemen. A visit to your local Legion hall or Cenotaph might uncover some clues. Who else landed on Juno Beach? Canadian troops did not take Juno Beach alone. A total of 21,000 Allied troops landed at Juno Beach on D-Day. One-third of these soldiers were British. Centaur tanks of the Royal Marine Armoured Support Regiment and the “funnies” of the 79th Armoured Division (including Shermans with mine flails and Churchill AVREs — Armoured Vehicle Royal Engineers) supported the Canadian assault. No. 48 Royal Marine Commando landed at Saint-Aubin-sur-Mer and protected the Canadians’ eastern flank. The British also provided troops for beach defence, anti-aircraft units, and logistical support. The 8th Battalion, King’s Regiment and the 5th Battalion, Royal Berkshire Regiment landed with the Canadian assault infantry. They helped their Dominion cousins secure Juno Beach. The Royal Air Force landed units for setting up barrage balloon defences. Royal Navy (RN) forward observers worked with the Canadian troops to call in fire support from the armada offshore. The RN also provided signallers and Beach Commandos to manage Juno Beach as part of a logistical network that stretched back to England. After the fighting moved inland, Courseulles-sur-Mer became an important port used by the British to supply the forces ashore. What about Canadian sailors and airmen? For D-Day to succeed the soldiers needed the support of the navy and the air force. The Royal Canadian Navy (RCN) deployed 61 warships of varying sizes – minesweepers, corvettes, frigates, and destroyers– on D-Day. They helped clear the English Channel of mines, protected landing and cargo ships, and bombarded the French coast during the assault. Seventeen Canadian motor torpedo boats patrolled the channel and kept German vessels pinned in their ports. The RCN also crewed 46 landing craft that brought Canadian and British troops to Juno Beach. About one month after the landings the RCN’s “W” Beach Commando began organizing and directing the flow of traffic across part of Juno Beach. The Royal Canadian Air Force committed 37 squadrons in support of the invasion. These ranged from fighter and reconnaissance squadrons directly supporting the landings, coastal patrol squadrons keeping an eye out for German U-boats and warships, and bomber squadrons attacking German coastal defences or lines of communication. Canadians, perhaps as many as half of those involved, also served in Imperial squadrons alongside other airmen of the British Commonwealth. What role did Canadians play in deception? The Allied planners presented the Normandy landings as a diversion. The imaginary main effort would feature First Canadian Army as part of Lieutenant-General George S. Patton’s fake First United States Army Group (FUSAG). The target was Calais, well north of the actual D-Day invasion beaches. This induced the Germans to disperse their forces and helped make the landings a great success. It also significantly delayed German efforts to reinforce Normandy. In order to convince the Germans of the veracity of FUSAG, the Allies concocted Operation Quicksilver. Quicksilver was an elaborate deception plan which included fake wireless traffic, dummy vehicles and equipment, actual troop movements in England, and a bombing campaign focused on Calais. 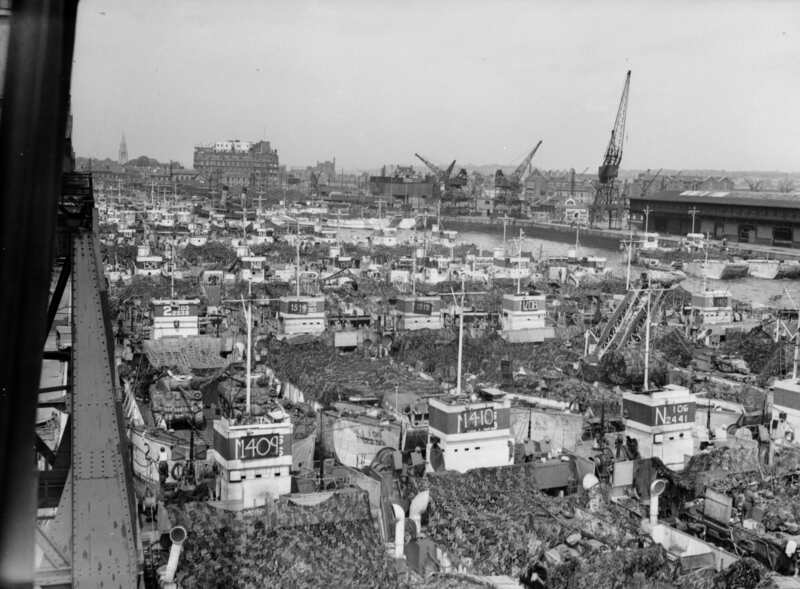 Canadian troops yet to sail to Normandy played a crucial role from England in keeping the threat to Calais alive. What role did the weather play on D-Day? A channel storm delayed the invasion, which the Allies had originally scheduled for June 5th, 1944. The weather improved just enough on June 6th to carry out the landings. This meant that most of the assault troops had to endure an extra day at sea in extremely rough conditions. Seasickness was common. The Canadian Scottish Regiment’s war diary noted: “In spite of the anti-seasick pills, which were taken by all ranks last night and this morning, Bags, vomit” were used by many. The weather had several broad effects on the landing. First, it afforded the invasion force protection from enemy air and naval activity. Second, it contributed to the surprise the landings achieved. German generals, including Field Marshal Erwin Rommel, did not expect a landing in this weather and were, in many cases, not at their respective headquarters (Rommel was visiting his wife in Germany and others were in Paris conducting war games). The weather scattered the airborne forces and made it difficult for some units to accomplish their missions. This wide scale dispersion did, however, contribute to the German confusion as to the location of the main Allied effort. The troops at sea would have had little idea of this bigger picture. What mattered to them was the small sector of the beach they were assigned. In some sectors of Juno Beach, the swimming (Duplex Drive) Sherman tanks were not launched with the assaulting infantry due to the danger of sinking in the high seas. In other sectors, especially Omaha, the tanks launched too far from the coast and many failed to make it to the beach, often taking their crews to a watery grave in the channel. Low cloud limited the effectiveness of the aerial bombardment. Accuracy suffered and the beach defences were largely intact (although the troops manning them were understandingly demoralized by the show of force) when the assault troops reached the sand. With limited support, the individual soldier’s experience in those early hours would have been terrifying. The success of the invasion came down to hundreds and thousands of individual acts of bravery that morning. During the Second World War Canada was part of an international coalition. Canadian forces served under British command and ultimately reported to American General Dwight Eisenhower, the Supreme Allied Commander. Soldiers, sailors, and airmen (and women) from Australia, Belgium, Czechoslovakia, France, New Zealand, the Netherlands, Norway, and Poland combined forces to liberate Western Europe. Meanwhile, Russia (then the Soviet Union) fought a massive war with German forces in Eastern Europe. The Juno Beach Centre proudly flies the flags of 10 nations in recognition of those who fought alongside Canadians during the summer of 1944. Together!, a free temporary exhibition in the centre’s Museum Hall, highlights the contributions of those Allied nations on land, in the air, and at sea during the Battle of Normandy. Did Canadian troops advance the furthest inland on D-Day? On June 6th, 1944 Hugh Buckley’s Stuart light tank halted on a rise overlooking the Norman village of Carpiquet and its nearby airport. Hugh, the tank’s gunner, and his crew had landed on Juno Beach earlier that day. The airport was their objective. It would make a good harbour for the tanks of the Sherbrooke Fusiliers as they supported the North Nova Scotia Highlanders, who were to dig in at Carpiquet and wait for the expected German counterattack. Yes. Canadian troops advanced the furthest inland on D-Day. Although armoured units like Hugh’s Sherbrooke Fusiliers and the 1st Hussars probed even deeper into Normandy, infantry battalions secured and held the ground. For the North Nova Scotia Highlanders, the advance ended some 10 kilometres inland, tied with the Queen’s Own Rifles of Canada (which had also led the assault on Juno Beach) for the furthest permanent advance of any unit on D-Day. But it wasn’t a contest to see who could capture the most territory in one day. The Allies hoped they could capture ground rapidly in the confusion following the landings, but they also needed to link the beachhead and ensure the various assault forces could support one another. Why did the Canadians and Allies not achieve their D-Day objectives? The 3rd Canadian Infantry Division’s D-Day objective was a railway line linking Caen in the east to Bayeux in the west. It was codenamed “Oak.” Here they would deploy defences and await the expected German counterattack. By the evening of June 6th, the Canadians were well on their way to their D-Day objectives, but the invasion was not progressing as quickly in other sectors. The Americans at Omaha had a tenuous foothold and the British at Gold had yet to link up with them. Meanwhile, a counterattack by 21st Panzer Division made it to the coast between Juno Beach and Sword Beach to the east. At approximately 7pm Lieutenant-General Sir Miles Dempsey (commander of the Anglo-Canadian landing forces for D-Day) ordered the Canadians to dig in at “Elm,” their intermediate objective. They would continue the advance in the morning. Although the Canadians could have reached their objectives by dusk, they would have arrived without British troops covering their flanks to the west and east. This would have left them particularly vulnerable to any German counterattack that developed the next day. Did Canadian women serve in Normandy? Absolutely. Canadian nurses served in Normandy with both the Royal Canadian Air Force and the Royal Canadian Army Medical Corps. The first Canadian Nursing Sisters in Normandy landed at Juno Beach on 19 June 1944 as members of No. 2 Royal Canadian Air Force Mobile Field Hospital. Three Canadian Army General Hospitals and three Canadian Casualty Clearing Stations based near Bayeux and Caen all had female nursing staff. Although women were not part of the Canadian forces in battle on D-Day, they played a variety of roles.Many supported the Normandy campaign from the United Kingdom as members of the Canadian Women’s Army Corps, the Women’s Royal Canadian Naval Service, or the Royal Canadian Air Force Women’s Division. A temporary exhibit at the Juno Beach Centre called Great Women During the War 1939-1945 outlines further experiences of women at war. What was the human cost of Canada’s participation? D-Day and the Battle of Normandy were costly victories. On D-Day alone 340 Canadian soldiers died on or near Juno Beach and 574 were wounded. A further 19 were killed in action, 10 wounded, and 84 captured with the 1st Canadian Parachute Battalion. The Royal Canadian Navy suffered no fatal casualties (though several were wounded) on D-Day while the Royal Canadian Air Force had 22 airmen killed and one fatally wounded (he died three days later). You can view a complete list of Canadian D-Day fatal casualties in this PDF. The Battle of Normandy, lasting from 6 June to 21 August 1944, was also deadly. Approximately 5,500 Canadians were killed in action and lay buried in the Commonwealth War Graves Commission cemeteries in Normandy, France. Some 90,000 Canadians took part in the fighting. You can support our educational and commemorative initiatives by sponsoring the dog tags of one or more of the 5,500 individuals who made the ultimate sacrifice.